They’re called soundwalls, and they’re protecting ears from an unending cacophony of traffic that’s more than just a nuisance. Freeway noise can lead to hearing impairment, anxiety, sleep disturbance and hypertension. But the wall wasn’t built and noise complaints grew as the entire Hollywood Freeway was opened several years later, clogging the road with 183,000 vehicles a day — almost double the volume it was designed to carry. In 1954, L.A. Mayor Norris Poulsen appointed a committee to study the noise caused by the 101 Freeway. 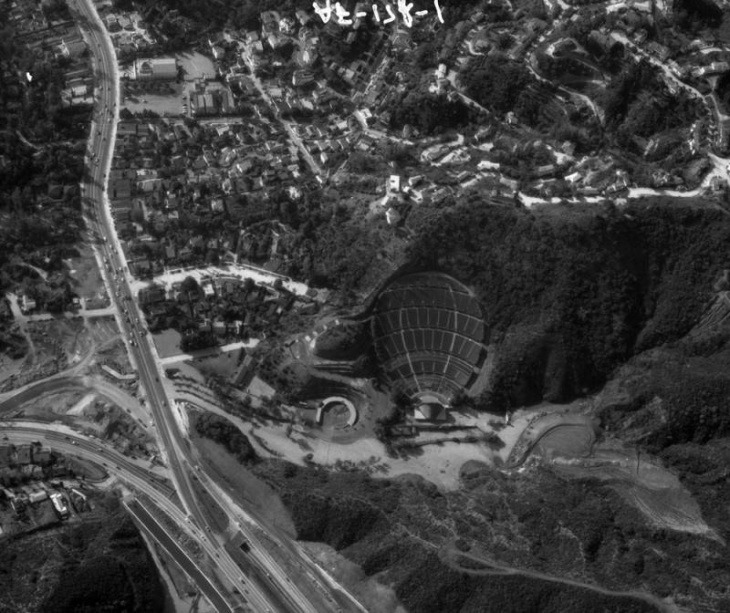 According to L.A. City Council records from that time, the city’s general manager recommended developing a sound barrier consisting of high vegetation to screen the Hollywood Bowl. 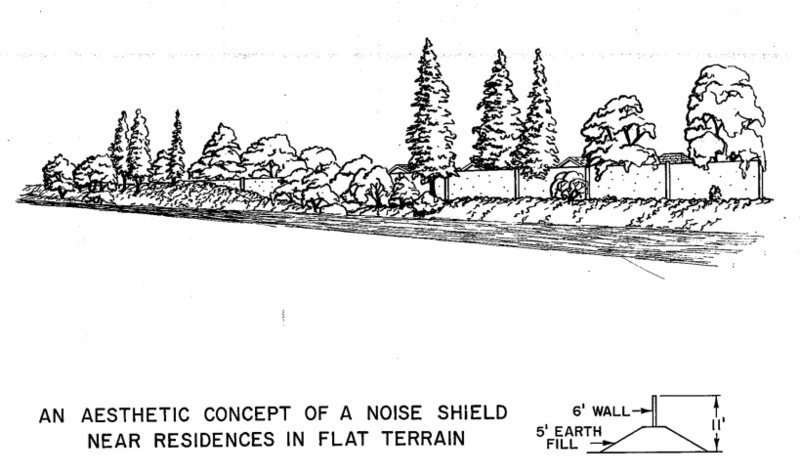 Then in 1968, the California Department of Public Works built what is believed to be the state’s first official freeway soundwall on Interstate 680 in Milpitas, near San Jose. Sixty-seven decibels was chosen as the threshold “because it was found that that is the level at which you can carry a conversation in the outdoors,” said Ben Jong, senior manager of transportation planning for Los Angeles Metro. Soundwalls don’t eliminate all noise, but they aim to reduce it by a noticeable level. Whenever the California Department of Transportation recommends a soundwall, they make sure that “the wall will reduce the noise level by a minimum of 5 decibels,” said Jin Lee, a senior transportation engineer in charge of Caltrans’ Noise and Vibration Unit, “because 5 decibels is what we consider a readily noticeable change.” Put another way, a 5 decibel reduction is like a 25% decrease in loudness. If you want to hear the difference a soundwall makes, here’s what it sounds like directly on the side of the 10 Freeway. And here’s the difference behind the soundwall. While the vast majority of soundwalls are composed of concrete blocks, they don’t have to be. Any material will work, as long as it is dense and thick enough. 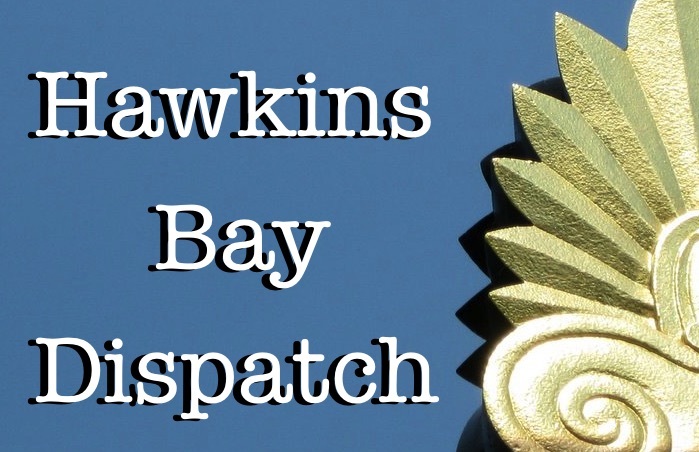 The city of Long Beach erected a soundwall in 2013 made of mulch. Dubbed “The Great Wall of Mulch,” it consists of two parallel chain link fences (12 feet high and 3 feet apart from each) running for 600 feet, with the space in between the fences filled with wood chips from city street tree trimmings. “As far as we know it’s the only sound barrier of its kind in the United States,” said Larry Rich, sustainability coordinator for the city. The mulch wall was comparatively cheap – costing about $125,000 – and it has the dual benefit of mitigating noise and air pollution. At this point, there are no plans to extend the pilot wall, but it shows that there are other options for soundwalls other than concrete. About 250 miles of soundwalls have been built throughout L.A. County, according to Caltrans. Another 200 miles of freeway are currently eligible, Jong said. But don’t expect them all to be constructed anytime soon. 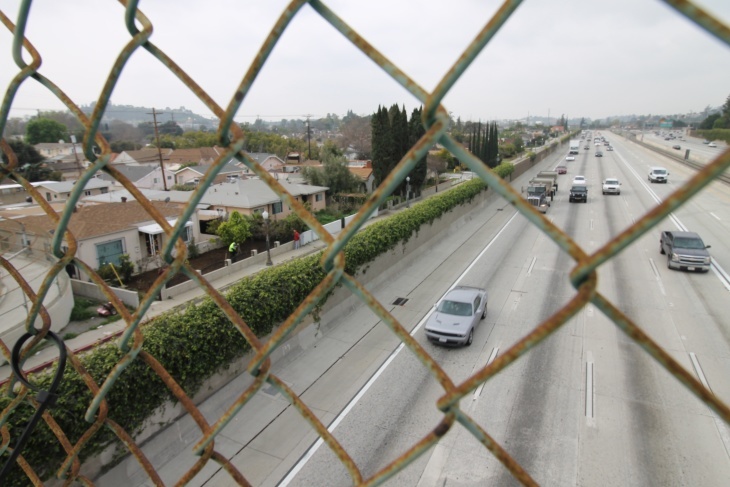 L.A. Metro inherited a serious backlog of projects when it took over the responsibility for building the majority of freeway soundwalls in the county from Caltrans in the late 1990s. New freeway soundwalls are still being built, but with construction costs of between $10-20 million per mile, according to Jong, Metro simply doesn’t have the funding to meet the demand. Agency officials estimate it would cost over $2 billion to build all the soundwalls currently on the eligibility list. But not everybody loves freeway soundwalls. Some people consider them a view-blocking eyesore. And some argue that the walls don’t even work that well. Editor’s note: A version of this story was also on the radio. Listen to it on KPCC’s Take Two. Previous When not doing product placement interviews, Mark Wahlberg likes to eat. And eat.